The facelift gets many changes which include both cosmetic and mechanical. 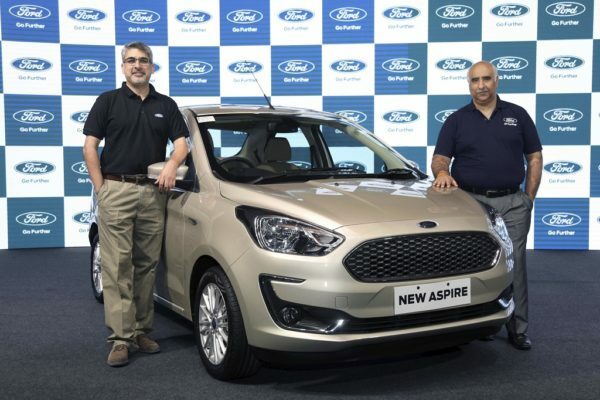 Ford India introduced the Ford Aspire facelift compact sedan at an introductory price starting from Rs. 5.55 lakhs. 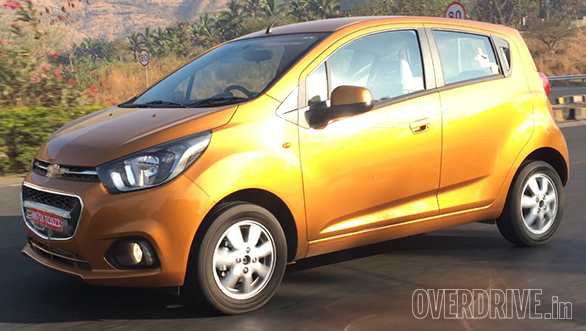 The car is available in five variants across two fuel options and seven colours. The compact sedan is now offered with a new three-cylinder 1.2L TiVCT petrol engine that is small, light and fuel efficient (previously the Aspire was powered by a 4 cylinder engine). The new engine generates 96 PS of peak power and 120 Nm of torque while delivering an outstanding fuel efficiency of 20.4 KM/l. The power is up by 8 PS and torque by 8 Nm. For the Diesel lovers, the Aspire continues to be powered with the trusted 1.5L TDCi engine delivering class-leading 100 PS peak power, 215 Nm of torque and higher fuel economy of 26.1 KM/l. 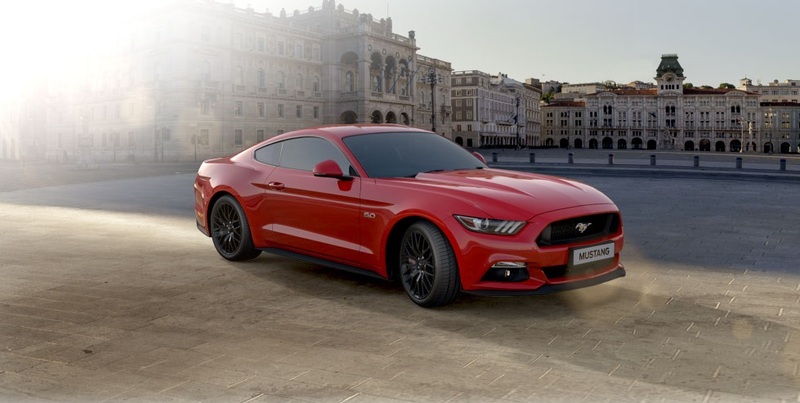 Both engines are paired with an all-new, five-speed manual transmission that’s sportier and fun-to-drive according to the company release (we need to drive the car to find out). This new manual transmission is almost 15% lighter and helps improve fuel economy while reducing NVH. 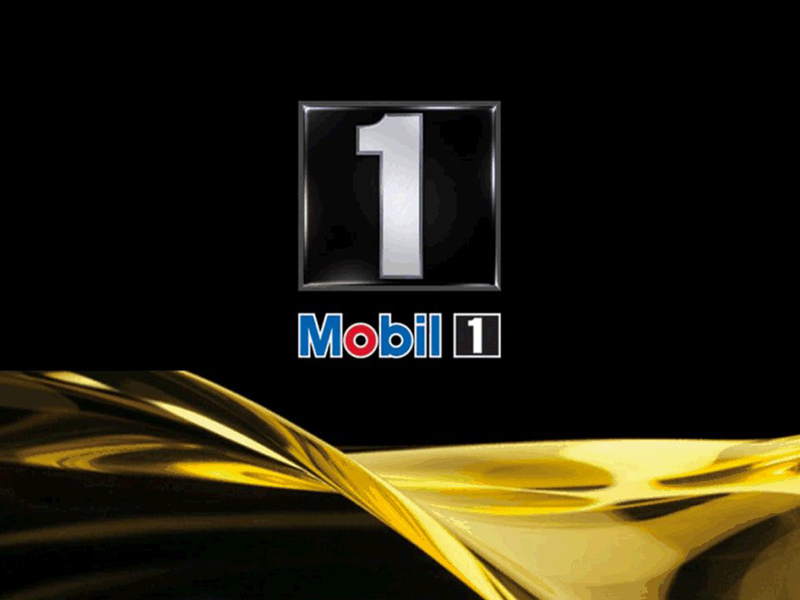 It requires 40% lesser gear oil than its predecessor. 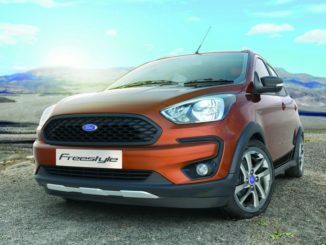 Ford is also introducing its latest six-speed Automatic Transmission on the Ford Aspire facelift which also does duty on the EcoSport. Paired to the latest 1.5L Petrol, three-cylinder engine, the Automatic Aspire delivers a peak power of 123 PS. All three engines will be the most powerful in their respective categories. 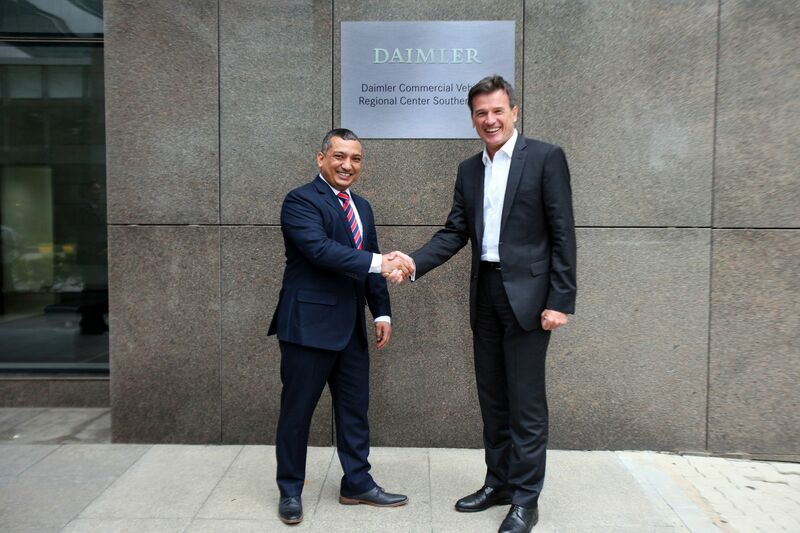 The facelift gets a redesigned front fascia with a dynamic three-dimensional cellular grille. New fog lamps are encrusted in a premium chrome surrounding into the front bumper. Headlamps feature a black encasing that looks sporty yet premium which reminds you of those offered on the S editions. The car features bigger 15-inch tyres with alloy wheels on the top trims. 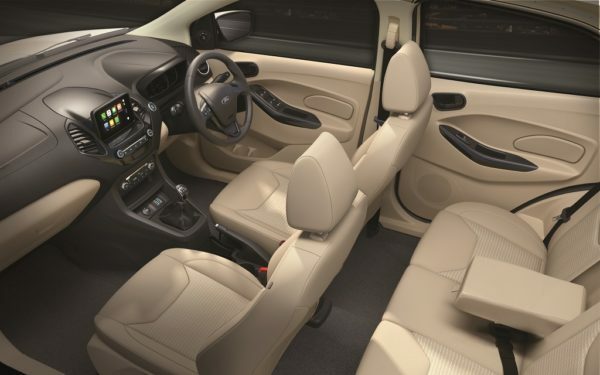 The cabin gets beige interiors, with a new in-car infotainment system, SYNC 3 with a 6.5-inch touchscreen which allows drivers to control their entertainment and connected smartphone using voice commands. 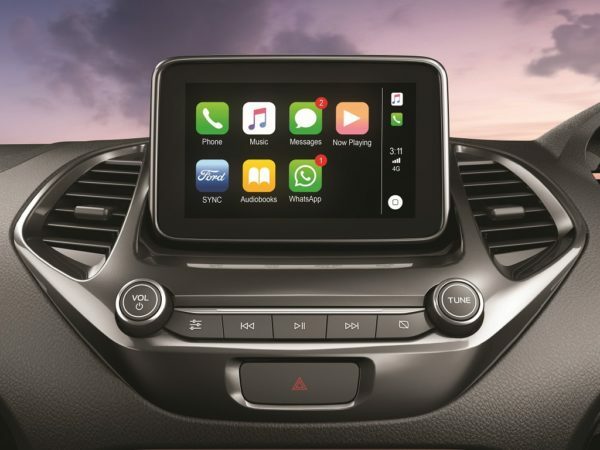 SYNC 3 system is Apple CarPlay & Android Auto compatible and will allow drivers to use navigation through their Apple CarPlay or Android Auto paired phones. The SYNC 3 system will also offer Emergency Assistance, a potentially lifesaving technology that automatically calls emergency services from a paired phone in case of an accident. Other features include reverse parking camera, automatic climate control system, two USB slots (new feature), push-button start/stop, electrochromic IRVM, rain-sensing wipers and automatic headlamps. 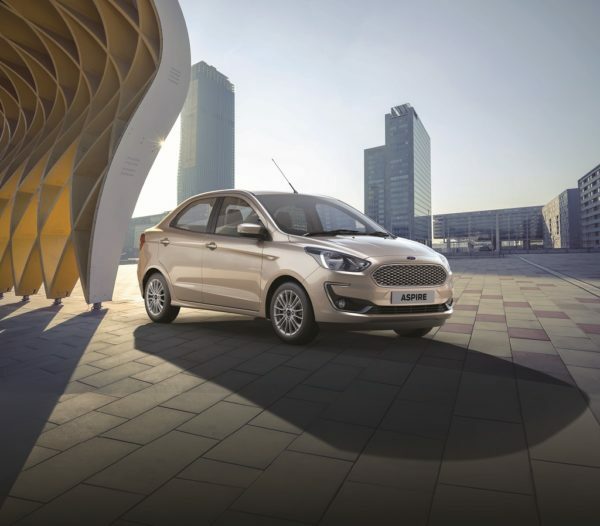 The compact sedan will continue Ford’s leadership on safety, offering standard dual airbags across the variant line-up. Six airbags are offered on the top Titanium+ trim. Anti-Lock Braking System (ABS) with Electronic Brake-force Distribution (EBD) are standard across the range. Ford is offering a first-in-class five-year or 100,000 KM warranty, which includes 2-year factory warranty and 3-year extended warranty. 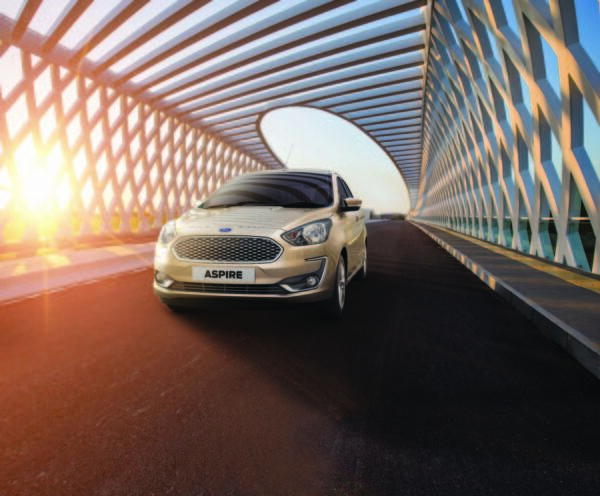 Alongside, the New Ford Aspire will continue to offer lowest scheduled service and maintenance costs in its segment – at just 38 paise per kilometre for petrol and 46 paise per kilometre for diesel over 100,000 KM. The compact sedan is available in seven colours, including White Gold, Moondust Silver, Smoke Grey, Absolute Black Deep Impact Blue, Ruby Red and Oxford White.